Having bought the wood finish yesterday, it was time to get started, and have the wood sealed from the elements, before it starts moving! The colour is Roble or Oak, in a matt finish, which gives the bed a rustic look. Also the side panels and the central leg. 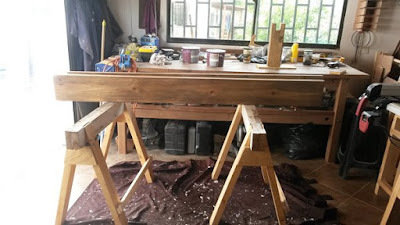 We are happy with the finish, I might even give the base a coat, if there is enough left, which I am sure there will be, as it called for two coats, but one coat has given the colour we like, so it wont get a second, and being inside, that should not be a problem. 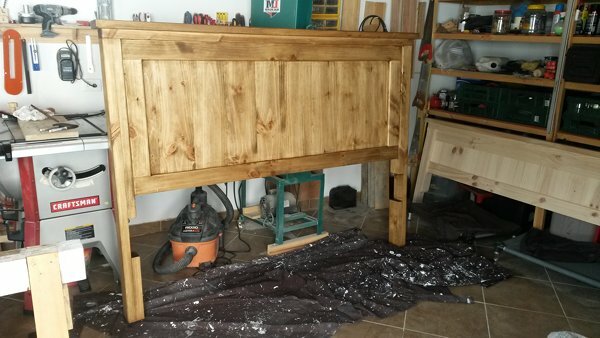 Hopefully tomorrow, I will get the second side of the Headboard, and the footboard completed, then I will leave it a few days, to allow any fumes to dissipate.